Fresh from the success of the Moto G5 and G5 Plus, Motorola has been hard at work on successors, aiming to make the best budget handsets ever. 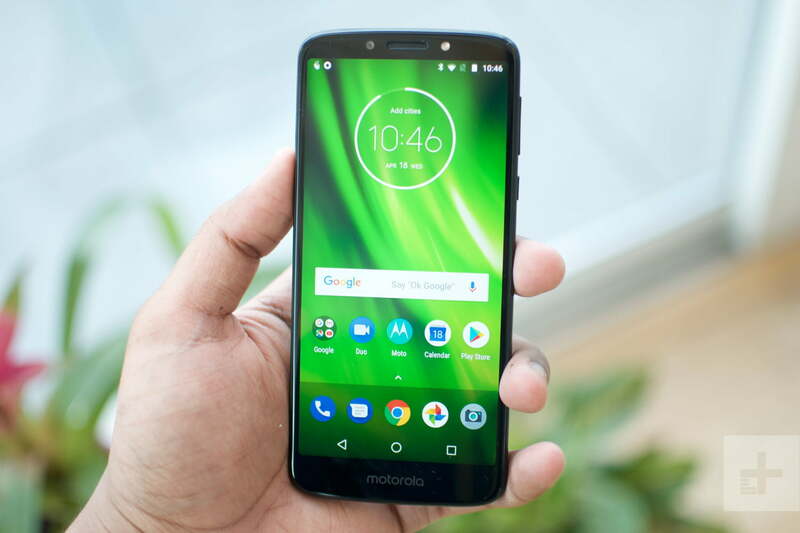 The new phones, called the Moto G6 and Moto G6 Play, feature a number of awesome, modern features, as well as a sweet new look. This time around Motorola has opted out of releasing a “Plus” version of the Moto G in the U.S., but we do know that a Plus version is coming to international markets. Thinking of buying one of the new Moto G6 models for yourself? You can read more in our Moto G6 and Moto G6 Play hands-on review. While we might have initially assumed that the new phones would feature a design similar to the Moto G5, Lenovo has opted to make the phones look a little more modern. 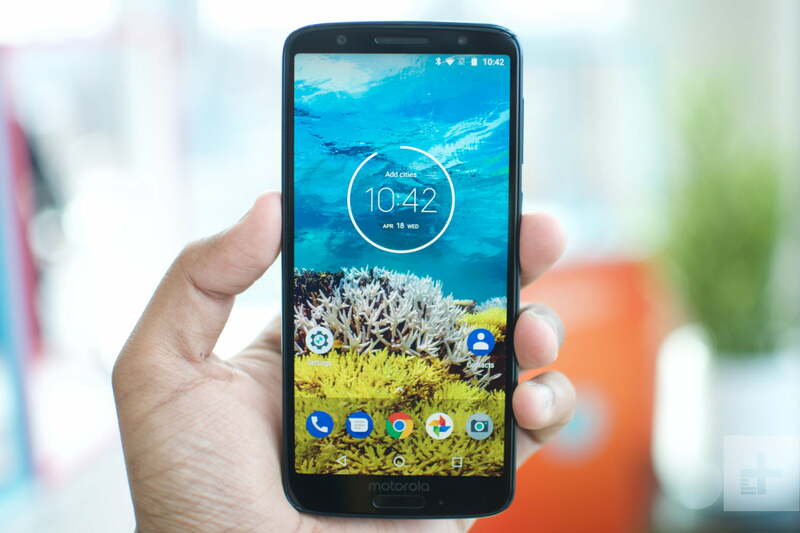 Like the Moto X, the Moto G6 and Moto G6 Play feature an 18:9 aspect ratio. The standard Moto G6 boasts a 5.7-inch IPS LCD display with a Full HD+ resolution. The Moto G6 Play, on the other hand, keeps the 5.7-inch display but has a standard HD+ resolution. 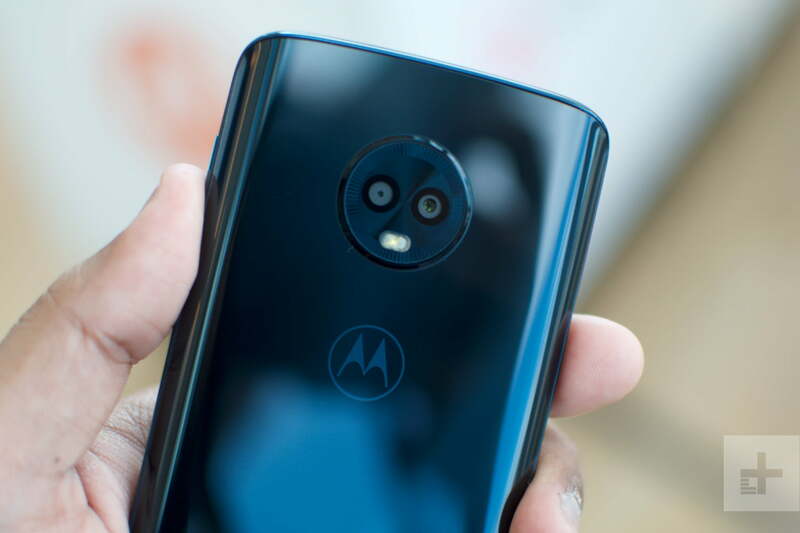 Like other Moto G devices before it, the standard Moto G6 features a fingerprint sensor underneath the display, while the G6 Play instead has a fingerprint sensor on the back, embedded in the Motorola logo. On the back, they have similar-sized camera modules, though the standard G6 has a dual-sensor camera, while the G6 Play instead has a single-lens camera. They’re also both available in two stunning new colors — black and deep indigo. Another difference is that the Moto G6 Play features an outdated MicroUSB port on the bottom instead of a USB-C — which is a little disappointing. In general, the phones look pretty good. Sure, they do look like budget devices — but they still look modern and like they belong in 2018. Like previous Moto G phones, the G6 and G6 Play feature a Qualcomm 400-series chip. The standard Moto G6 features a Qualcomm Snapdragon 450 processor, coupled with either 3GB or 4GB of RAM and either 32GB or 64GB of storage. It also has a MicroSD card slot, so you expand on that storage by up to a hefty 128GB, if you need. The battery on the device sits in at 3,000mAh. The Moto G6 Play is a little less powerful, but still pretty nice for the price. The device boasts a Qualcomm Snapdragon 427 processor, coupled with either 2GB or 3GB of RAM and either 16GB or 32GB of storage, depending on the model you go for. Like the standard G6, the phone does have a MicroSD card slot — so if you want to expand the storage you can do so by up to 128GB. The battery on the G6 Play is quite a bit bigger than that on the G6 — it sits in at 4,000mAh. 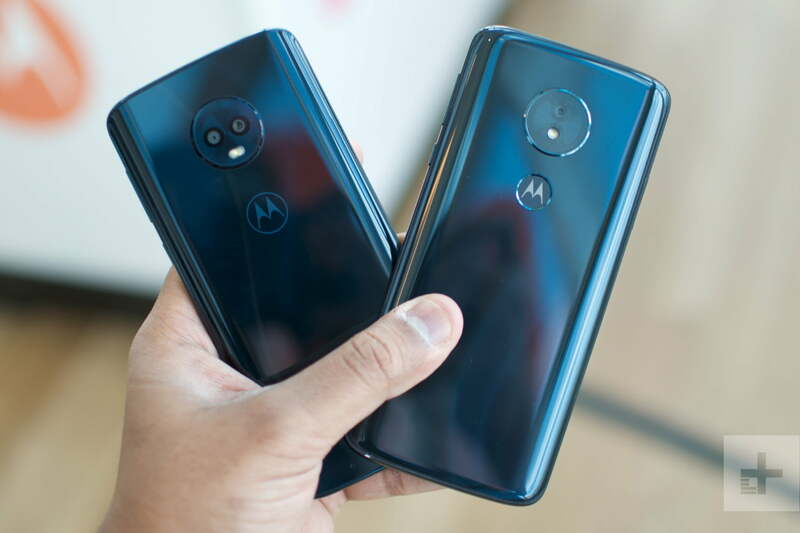 Model options, according to Motorola, vary by region — so you may not be able to choose between the 3GB/32GB model of the standard G6 and the larger, 4GB/64GB model. Like the Moto G5, the standard Moto G6 offers a dual-sensor camera. There’s a primary 12-megapixel sensor, coupled with a secondary 5-megapixel sensor. The cameras offer an f/1.8 aperture. We’ll have to wait and see just how well they perform — the dual-camera features in the Moto G5 left a little to be desired. The camera can record video at up to 1,080p at 60 frames per second. The front-facing camera on the device sits in at 8 megapixels. The camera offers some pretty cool features. For starters, Motorola says that it has a “selective focus” feature, that will allow you to take a photo, then change the area of focus and adjust the level of blur. You’ll also get things like face filters and active photos, which will capture a little video before and after a shot. The standard G6 also has a face unlock feature. The camera on the Moto G6 Play is a little less high-tech. It’s a single-sensor camera that comes in at 13 megapixels with an aperture of f/2.0, so it may not be as good at taking low-light shots. The front-facing camera comes in at 8 megapixels. Thankfully, it still offers some of the great features found on the standard G6, like selective focus and face filters. The Moto G6 and G6 Play will ship with Android 8.0 Oreo, though Motorola says that it will be upgraded to Android P when it becomes available. Unfortunately, the phone may not be updated much beyond that, though it will get security updates for two years. One feature that seems to be largely unique to Moto phones is the one-button navigation, which will be available on the standard G6. What that means is that you can use the home button to control all aspects of Android. Tap it once to go home, swipe right-to-left to go back, and right to left to multitask. Looking to get the Moto G6 or Moto G6 Play for yourself? The Moto G6 Play comes in at $199, while the standard G6 will be available for $249. The Moto G6 Play will be available primarily on prepaid carriers including Verizon Wireless, Boost Mobile, Cricket Wireless Virgin Mobile, Republic Wireless, and Ting Wireless. AT&T is the only U.S. carrier that will offer the Moto G6 Play on its postpaid plans. If you would rather purchase an unlocked G6 Play, its available at Best Buy, Target, Fry’s, and B&H Photo. As for the Moto G6, you will be able to find it on Verizon Wireless, Ting Wireless, and TracFone Wireless. Unlocked versions will be sold at Target, Best Buy, Fry’s, and B&H Photo. If you choose to pick it up on Verizon, you can get it for $10 a month through the carrier’s device payment plan. And if you’re looking for a deal, the Moto G6 is part of the Prime Exclusive Phones program, selling for $235. If you’re interested in international availability, check out the Moto website for more details. Updated on May 30: Added Prime Exclusive Phones availability.